On Thursday, June 18th, the Classics of Science Fiction Book Club met and discussed one of Ray Bradbury’s collections of short stories, The Illustrated Man. Some of the stories originally appeared in publications including The Saturday Evening Post, Planet Stories, and The Magazine of Fantasy and Science Fiction. The collection came together in 1951, presented as a frame narrative in which the illustrations (tattoos) on the body of a traveling carnival performer come to life while he sleeps alongside the unnamed narrator. While secondary to the stories contained within, and absent save for the prologue and epilogue, the frame device presents classic Bradbury imagery to bookend the collection that is vivid, albeit grotesque. In an attempt to give a bit of attention to all 18 stories, our group went through the book and pitched taglines for each one based primarily on what the title recalled to memory and some discussion of each story’s main themes. I’ll put the full list down below, but as a teaser, here is my favorite, formatted “Title: Our Tagline“–“The Veldt: Holodeck from Hell”. The latter half of our discussion explored a favorite topic in our group: “what makes this book a work of science fiction”? A few attendees were vehemently opposed to considering Bradbury science fiction, citing his tendency to utilize “hand-wavey” technology and (what some consider to be) consistent abuse of science fiction tropes, i.e. putting characters on Mars for the sake of an “off-world” setting with zero explanation of how those people arrive, survived, and appear to be carrying on “normal” lives despite being on a hostile planet. Others in the group cited Bradbury’s sense of wonder and expansive imagination as enough to include him among the ranks of SF writers. In an attempt to kind of ride the fence I suggested that Bradbury’s work, while distinctly in contrast to “Hard SF” such as Clarke, Niven, or Asimov, provides a more palatable entry point to the fantastic world of science fiction than some other traditional authors. Essentially, powerful stories transcend classification. 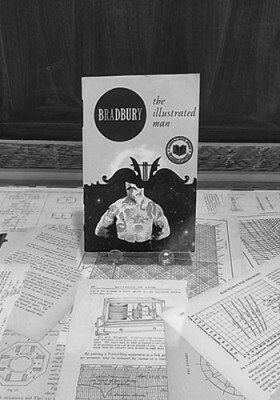 Bradbury’s work can be seen as both expanding the readership of SF and the assortment of tools available for authors to use when exploring their own fantastic realms of wonder and imagination. SF or not, the general consensus was that Bradbury wrote good stories. The characters are often compelling, the settings sparsely yet vividly described, the plot lines simple but not lacking, the themes apparent but (generally) not heavy-handed, and Bradbury’s prose is enchanting. While many of the stories in The Illustrated Man are utterly depressing, and at least one is…uncomfortable? for a contemporary audience to handle gracefully, Bradbury manages to maintain a certain sense of levity, even while floating through space, awaiting death as pieces of comet relieve you of your limps and the last remnants of your companionship irrevocably drift away. Bonus, Bradbury includes one story (“The Rocket”) that showcases the tremendous capacity that humans within a family have for compassion, sacrifice, and above all else, commitment to the happiness and well-being of those they hold most dear. Join us on Thursday, July 16th at 7pm for a discussion of Daniel Keyes’ Flowers for Algernon. We’ll also be accepting suggestions for the next list of 12 books we’ll be reading from Sept. 2015 through Aug. 2016. The list will be published at our August meeting (for Carl Sagan’s Contact). This entry was posted on Thursday, June 25th, 2015 at 11:58 am and is filed under Ada's Events, Book Clubs, Reader Response, Reviews. You can follow any responses to this entry through the RSS 2.0 feed. Both comments and pings are currently closed.